There are many miracles attributed to Raghavendra Swamy, the seer of Mantralaya. The list of miracles is so long that it would take hundreds of books and thousands of pages to fill them up. A Kaliyuga Kalpavruksha, Raghavendra Swamy performed miracles when he was alive and more of them after he entered Brindavana in Mantralaya in 1671. If he has appeared in dreams of people, he has been seen sitting in the Brindavana. To a selected few, he has come in the guise of a aged man. There are others, and I know a few, who have been blessed by Rayaru with Mantrakshethe. In fact, my own sister who stays in the United States has experienced several miracles of Raghavendra Swamy as have my parents, friends and relatives. To a chosen few, Rayaru has inspired them to become Haridasas as in the case of Prasanna Venkata Dasa whom he sent to Tirumala. To many others like Vadeendra Theertha, he appreciated their work and in case of Krishna Avadootaru he himself gave the base for the Raghavendra Tantra. What makes Raghavendra Swamy unique is that he performed his first miracle on the day he entered Brindavana. He helped Appannacharya swim across the turbulent Tungabhadra from Bichale. When a weeping Appanacharya stood before the Brindavana, Raghavendra showed himself to Appanacharya and also completed his composition. Since then, there have been scores of miracles and Raghavendra Swamy has shown his miracles to persons of all classes, caste, creed, age and even across countries. Generally, Raghavendra Swamy comes in the dream of devotees ho perform seves in Mantralaya. People come to Mantralaya with a wish and do seve to fulfill their harake (vow). The normal practice is to bathe in the Tungabhadra and do the seve. It is a practice to do seves for odd number of days, like three, five, seven. Rayaru appears in the dreams and he either blesses the person or tells him that he has no mukti in this world. But what happens if Rayaru does not come in the dream of a person even after he performs seve for several days. Well, this is a story about that. A devotee, who wanted a boon from Raghavendra Swamy, was doing seve to Rayaru at Mantralaya. He had met the priests who had told him the manner in which he has to do the seve. Several other people were doing seves before him and many commenced their seves after him. Some of the people whom he befriended told him that Rayaru had come in their dreams and that their wish had been fulfilled. They then went back from Mantralaya, singing the glory of Rayaru. Their tales inspired the devotee to redouble his efforts to get his wish fulfilled. Days passed into weeks and weeks into months and there was no sing of Rayaru coming in his dream. Distressed, the devotee came to Tiirumala where he had been told that Venkateshwara or Srinivasa too would fulfill wishes of his devotees. The devotee wrote out a letter and addressed it to Srinivasa. In it, he complained to Srinivasa about Rayaru. The gist of his letter was that while people who performed seve at Mantralaya after him were blessed by Rayaru, he was not. He complained that Rayaru had not shown him any mercy despite performing seve. The devotee then dropped the letter in the hundi and left Tirumala. When the temple officials (TTD) opened the hundi and emptied out its contents, they found the letter addressed to Srinivasa. 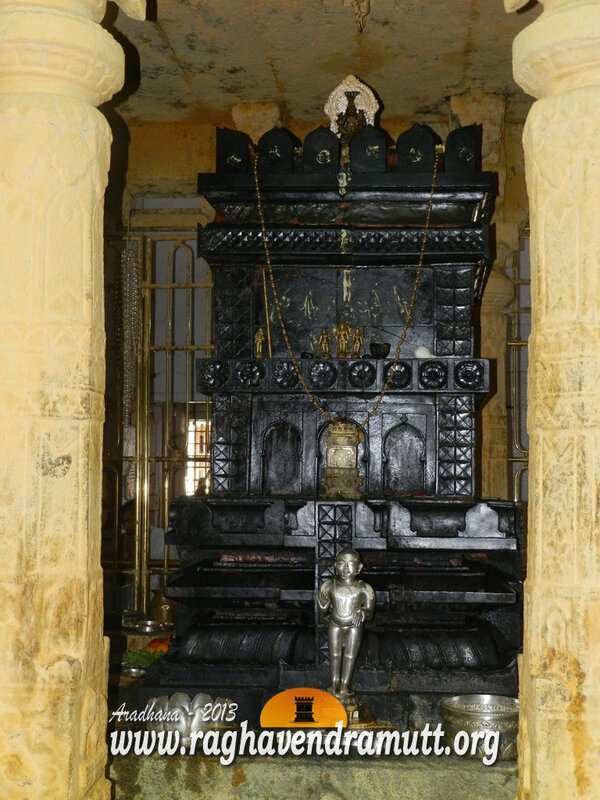 Not knowing what to do, the TTD officials handed over the letter to the archakas or priests who in turn read the complaint and placed it at the feet of Venkateshwara. (Venkateshwara or Srinivasa is the Mane Devaru or presiding deity of the house of Raghavendra Swamy and even his parents were great devotees of Srinivasa. In fact, Raghavendra was born after the couple prayed at Tirumala). What happened next is a matter of conjecture. Did Venkateshwara communicate the complaint to Rayaru or did the seer know by himself what the devotee had written. Rayaru then appeared in the dream of the devotee and asked him to come back to Mantralaya. The devotee returned to Mantralaya. He then bathed in the Tungabhadra and once again performed the seve of Rayaru.He could not believe his luck that Rayaru himself had summoned him to Mantralaya. The same night, Rayaru appeared in the dream of a devotee. In the dream, the devotee saw Raghavendra Swamy take up a big hammer and break a stone. He then showed a light to the devotee and disappeared. The devotee could not understand the dream. He then went to the archaka to get the dream explained to him. The archaka told him that Rayaru had said he would get his wish fulfilled but that he would have to wait for some time. The light that came when the boulder broke indicated that the devotee would get his wish fulfilled but for that he would have to pass harder tests of faith, devotion, sincerity and honesty. Well, the story ends here. The devotee went back both a sad and happy man. He was sad that his wishes could not be fulfilled but happy that Rayaru had come in his dreams twice and also indicated a way out of his predicament. The moral of the story here is that Raghavendra shows us the way even when there appears to be insurmountable difficulties or unbreakable barriers. This is the message that Haridasas such as Vijaya Dasa, Jagganatha Dasa, Gopala Dasa, Prasanna Venkata Dasa, Mahipati Dasa, Vebugopala Dasa, Guuru Jaganatha Dasa (This dasa is different from the Jagganatha dasa who wrote harikathamrutasara) and others like Appanacharya, Krishna Avadootaru, Ibharahamapura Appa have conveyed to us in their writings. This is the same message that our seers have been conveying to us and that is the path of righteousness and dharma is not an easy pone to take but if you decide to tread on this path, moksha is sure but it may take some time in coming. This is also the essence of what Madhwacharya and Raghavendra Swamy preached.